The Padres announced Thursday that they’ve bolstered their infield depth with the addition of veteran second baseman Ian Kinsler on a two-year contract with a club option for a third season. The BBI Sports Group client will reportedly take home an $8MM guarantee in the form of a $3.75MM salary in both 2019 and 2020, as well as a $500K buyout on a $3.5MM option for the 2021 season. Kinsler, 36, is a known commodity for Padres GM A.J. Preller, who was an assistant GM with the Rangers during Kinsler’s tenure in Texas. Kinsler will bring to the San Diego organization one of the game’s premier defensive players, though his once-potent offense has tailed off in recent seasons. Since Kinsler’s debut in 2006, only six players in all of Major League Baseball have topped his mark of +118 Defensive Runs Saved. That’s not just a case of longevity, either, as Kinsler ranks fourth in DRS even over the past half decade and turned in a strong +10 DRS in 2018 alone. Ultimate Zone Rating has been similarly bullish on his defensive aptitude. The 2018 campaign, however, saw Kinsler post a career-worst .240/.301/.380 batting line through 534 plate appearances between the Angels and Red Sox. His bat was only a bit below the league average with the Halos prior to the swap, though his production diminished greatly in 137 PAs with the Red Sox (.242/.294/.311). Overall, however, Kinsler’s premium defense and quality baserunning still led both Baseball-Reference and Fangraphs to peg him at a bit more than two wins above replacement. A move to the spacious Petco Park probably won’t help Kinsler’s offense, but his glove and speed give him a fairly high floor at what looks to be a palatable price point. Kinsler steps onto a Padres roster that, since season’s end, has jettisoned both Cory Spangenberg and Carlos Asuaje. He could get the early bulk of the work at second base in the event that Luis Urias heads to Triple-A for further development or, as MLB.com’s AJ Cassavell suggests (via Twitter) should Urias open the year at shortstop. In somewhat contradictory fashion, though, Ken Rosenthal of The Athletic tweets that the Friars still consider Urias their primary second baseman, adding that Kinsler could work at third base early in the year. Suffice it to say, the organization may not yet have a defined role in mind for Kinsler, whose ultimate position is likely somewhat dependent on the moves that San Diego makes between now and Opening Day. The Padres do have one of the game’s best overall prospects in shortstop Fernando Tatis Jr., though once Tatis and Urias are both in the Majors, Kinsler could slide over to third base on a full-time basis or assume a utility role off the bench. In any event, it seems clear that Kinsler will be counted upon to appear at multiple positions over the life of his Padres tenure. Kinsler’s addition further calls into question Jose Pirela’s role with the team, though it’s worth noting that the Friars have a full 40-man roster and will need to subtract someone in order to make the contract official. From a payroll standpoint, Kinsler should push the Padres to somewhere in the $83-84MM range for the coming season. The fact that there’s an option year on the deal suggests there’ll be a buyout, and therefore the annual salaries will both likely check in a bit south of $4MM. And the Padres only had about $60.5MM on the books for the 2020 season prior to adding Kinsler. Ken Rosenthal of The Athletic first reported the agreement (via Twitter). MassLive.com’s Chris Cotillo reported the option value (Twitter link). Fancred’s Jon Heyman tweeted the annual breakdown of the deal. The Padres announced Thursday that they’ve designated southpaw Clayton Richard for assignment, which will clear a spot on the 40-man roster for veteran second baseman Ian Kinsler, whose previously reported two-year contract with San Diego has now been formally announced. Richard, 35, inked a similarly affordable two-year pact with the Friars prior to the completion of the 2017 season — jumping at the opportunity to guarantee himself multiple years as opposed to exploring the open market in his mid 30s. Richard received that two-year reward at the tail end of a season in which he proved a durable ground-ball machine, pitching 197 1/3 innings of 4.79 ERA ball that came with more promising peripherals. That season, Richard averaged 6.9 K/9, 2.7 BB/9 and 1.09 HR/9 to go along with a gaudy 59.2 percent ground-ball rate. Fielding-independent pitching metrics such as FIP (4.26), xFIP (3.76) and SIERA (4.06) all graded him out much more favorably than his ERA. The 2018 version of Richard wasn’t all that different in terms of K/BB and ground-ball tendencies, and his home run rate was a mirror image of that 2017 rate. Richard, though, did take a slight step back in terms of strikeouts, control and grounders, though, and because his contact-oriented approach leaves little margin for error, his ERA jumped to 5.33 in 158 2/3 innings. Fielding-independent metrics still liked Richard better than his ugly ERA, but there’s no denying that his 2018 performance was diminished across the board. More troubling Richard’s outlook is the fact that his season was preempted in August when he went under the knife to alleviate left knee troubles that had plagued him since early in the season. While there’s no indication that Richard is expected to miss significant time in 2019 as a result of the operation, the procedure nonetheless further casts doubt on his ability to function as a stabilizing innings eater moving forward. San Diego will be on the hook for a $3MM salary for Richard in the coming season unless the organization is able to find a trade partner or Richard is claimed on waivers. The latter scenario seems particularly unlikely, given that $3MM commitment, as an interested team could simply opt to let Richard clear waivers, take his release, and then sign for the league minimum of $555K. If Richard does land with a new team, the Padres will be off the hook for the pro-rated portion of that $555K for any time Richard spends at the big league level. Following last month’s non-tender of Jonathan Schoop, the Brewers’ exhaustive, months-long search for a second baseman continues with the team’s pursuit of Jed Lowrie, per Ken Rosenthal of The Athletic. Lowrie, of course, is fresh off an outstanding, 4.9 fWAR 2018 season with Oakland, itself on the back almost identical offensive campaign (119 wRC+ in ’17, 122 in ’18) the year before. MLBTR projects the 34-year-old to earn a solid 3-year, $30MM deal this offseason, though Lowrie’s camp, given his recent two-year output, will surely be fighting for more. The risk with the switch-hitter lies in his subpar performance across multiple seasons (2011, ’14, ’15, and ’16), in obvious addition to his age and former propensity for the serious injury, plus the tendency of second basemen to decline earlier than most, but there could be surplus value aplenty to be found if he continues on his current trajectory. The Nationals, another team with a hole at the keystone, offered Ian Kinsler a one-year deal before the 36-year-old signed a two-year pact with San Diego, per Rosenthal. Earlier this week, the club was said to have “checked-in” with free agent second-sacker D.J. LeMahieu, who would likely command a deal in excess length to the one offered to Kinsler, so it seems unclear as to exactly which direction the club will go in terms of filling the position. Carter Kieboom, a 21-year-old middle-infield prospect, has raked in the low levels of the minors and may just be a season and a half or so away, so perhaps the club is seeking just a one- or two-year stopgap in the interim. Per Alex Pavlovic of NBA Bay Area, the outfield-naked Giants are interested in Blue Jays CF Kevin Pillar. The club, who in years past has shown little interest in staking a defense-first player at the position, despite its park’s huge territory in right-center field, may be undergoing a philosophical about-face under its new, analytics-driven regime. The club, of course, is stacked with right-handed fly-ball types in the rotation, and would seem to benefit in large measure from a ball-hawking center-fielder like Pillar. The 29-year-old’s defensive metrics took a bit of a hit last season, but his peak from ’15-’17 (50 DRS) has rarely been matched in recent times. 25-year-old Steven Duggar would seem, at least in part, to fit the bill, but whether or not his bat will play – Steamer projects an 81 wRC+ for ’19 – is still an open question. New Dodgers reliever Joe Kelly, who this week agreed to a 3-year, $25MM with the team, explained (audio version) to WEEI’s Rob Bradford why he chose LA, noting that the team was the first to extend its offer to three years. Though the duration may come as little surprise, it is notable that it came from the Dodgers, who in recent times (Kenley Jansen excluded) have preferred their relievers to be of the under-the-radar variety. The Tigers, Brewers, Athletics and Nationals are among the teams interested in free-agent second baseman Ian Kinsler, according to Jon Morosi of MLB.com. The Brewers have met with Kinsler at the Winter Meetings, Tom Haudricourt of the Milwaukee Journal Sentinel relays. Detroit’s inclusion on the list is particularly interesting in light of the fact that Kinsler thrived there from 2014-17, before the team traded him to the Angels last offseason. The 36-year-old ended up dividing the season between Anaheim and Boston, where he combined to hit a less-than-stellar .240/.301/.380 (87 wRC+) in 534 plate appearances. But to Kinsler’s credit, he swatted 14 home runs, stole 16 bases and, for the 12th consecutive season, posted at least 2.0 fWAR (2.3). Blue Jays right-handers Marcus Stroman and Aaron Sanchez have been mentioned in trade rumors this offseason, though teams are finding it especially difficult to pry them loose. Per Ben Nicholson-Smith of Sportsnet, interested clubs have found the Jays’ asking price for both pitchers to be “uncomfortably high.” Because Stroman and Sanchez each have two years of control left, Nicholson-Smith suggests the Jays are holding out for a return similar to the one the Mariners received from the Yankees for James Paxton. That doesn’t seem realistic on Toronto’s part, however, as both Stroman and Sanchez struggled through injury-limited seasons in 2018. Yankees GM Brian Cashman met with free-agent reliever Adam Ottavino’s representative Tuesday, though no real offers have been exchanged to this point, Joel Sherman of the New York Post tweets. Ottavino, 33, remains near the top of the Yankees’ free-agent wish list, Sherman notes. With free agents Zach Britton and David Robertson possibly on their way out of the Bronx, Ottavino – a New York City native – is a logical target for the club. There’s “no chance” free-agent reliever Andrew Miller will re-sign with the Indians, Paul Hoynes of cleveland.com writes. On the other hand, there’s still a possibility of fellow FA reliever Cody Allen returning to Cleveland, according to Hoynes, though he adds that it would be surprising. Although both Miller and Allen fell off in 2018, it still appears the two highly accomplished late-game arms will rake in sizable paydays on the open market. Free-agent lefty Wade Miley’s camp is “confident” he’ll reel in a multiyear contract, Adam McCalvy of MLB.com reports. The 32-year-old Miley’s clearly in far better position than he was last offseason, when he had to settle for a minor league deal with Milwaukee. Miley went on to hold his own over 80 2/3 innings with the Brew Crew, pitching to a 2.57 ERA/3.59 FIP with a 52.8 percent groundball rate. At the same time, though, he recorded unappealing strikeout and walk numbers (5.58 K/9, 3.01 BB/9) and benefited from an ultra-low, likely unsustainable home run-to-fly ball rate of 5.2 percent. The Athletic’s Jen McCaffrey was one of many who tweeted out comments from Dave Dombrowski on the Red Sox offseason this morning. Among the notable tidbits, the Red Sox are apparently prepared to send out qualifying offers to some of their free agents, though Dombrowski couldn’t speak to the specifics until MLB releases the names on Friday. Presumably, this list includes only one name: closer Craig Kimbrel. Boston could look to replace him with in-house options, the top candidates being Matt Barnes and Ryan Brasier (twitter links). If Kimbrel does depart, bolstering the bullpen could very well become a focus of the Boston offseason – especially if fellow free agent Joe Kelly follows Kimbrel out the door. One player who definitely won’t be receiving a qualifying offer is Nathan Eovaldi – he is ineligible after being acquired mid-season from the Rays. Competition for the right-hander is expected to be fierce after his gutsy playoff performance with the Red Sox. Fellow mid-season acquisitions Steve Pearce and Ian Kinsler are also ineligible to receive qualifying offers. On the health front, MLB.com’s Ian Browne was among those to confirm that Chris Sale is not expected to undergo offseason surgery (via Twitter). The lanky left-hander needs only rest to be ready for Spring Training. Jason Mastrodonato of the Boston Herald adds (via Twitter) that the team is hopeful that Dustin Pedroia will be ready in time for Spring Training, though that is far less certain. The catching situation in Boston remains a crowded, but capable field. It is unlikely that Boston will head into next season with all three of Christian Vazquez, Sandy Leon and Blake Swihart on the active roster – but it’s not an impossibility (Twitter link). Boston experimented with using Swihart in a superutility role last season, but it’s unclear whether or not Boston believes that’s a sustainable solution moving forward. On the whole, Dombrowski is understandably pleased with the current state of the Red Sox and would be happy to bring back the entire squad as currently constituted for 2019, per the Boston Globe’s Alex Speier. Thus far, the Red Sox have kept David Price in the fold after he forewent his opt-out clause, as well as Eduardo Nunez, who picked up his $5MM option for 2019. It will obviously be expensive to keep this core together long-term, but as of now, Boston ownership has not mentioned staying under the luxury tax as a priority for 2019. The Red Sox have chosen Nathan Eovaldi, not Rick Porcello, to start Game 3, Pete Abraham of the Boston Globe was among those to report. Porcello is slated to take the ball in Game 4, though manager Alex Cora said that could change if the Red Sox need him out of the bullpen Monday, Chris Cotillo of MassLive.com tweets. Game 2 starter David Price also seems likely to be available in relief, Ian Browne of MLB.com relays. As for the 28-year-old Eovaldi, a former Yankee whom the Red Sox acquired from the Rays in July, he’s in line for his first playoff appearance. The hard-throwing right-hander earned his way into Boston’s October rotation by logging a 3.33 ERA with 8.0 K/9 and 2.0 BB/9 in 54 regular-season innings with the team. 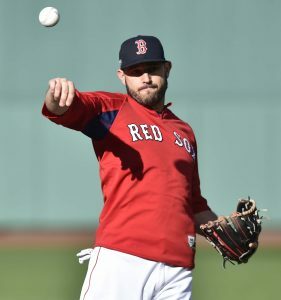 Second baseman Ian Kinsler – who, like Eovaldi, joined the Red Sox in a late-July trade – may be a regrettable pickup in the wake of an Aug. 3 hamstring injury, Alex Speier of the Boston Globe observes. Kinsler got off to a nice start with Boston, but since suffering the injury, his production has plummeted. The 36-year-old has slashed a measly .234/.280/.295 with a subpar 85.1 mph average exit velocity in 34 games dating back to his return from the disabled list, notes Speier. Further, his ongoing presence in the Red Sox’s lineup has kept Brock Holt – who thrived in September – on the bench. And Speier goes on to point out that adding Kinsler cost the Red Sox young reliever Ty Buttrey, who turned in quality numbers for the Angels after the trade and may have helped shore up Boston’s bullpen had it kept him. Of course, as Speier writes, there’s still time for Kinsler to emerge as a key contributor for Boston this postseason. He did collect a hit in each of their first two playoff games, including an RBI double on Saturday. After leaving Saturday’s game with right hamstring tightness, first baseman Mitch Moreland is receiving “aggressive treatment,” Evan Drellich of NBC Sports Boston was among those to tweet. His status for Monday is still up in the air, but as was the case late Saturday, Cora expects Moreland to remain on Boston’s ALDS roster, per Cotillo. In his latest column, Paul Hoynes of the Cleveland Plain Dealer calls it “unlikely” that outfielder Leonys Martin will play with the Indians again this season. A trade deadline pickup, Martin has been on the disabled list for more than a week after being diagnosed with a bacterial infection that, at one point, was considered to be life-threatening in nature. While all of baseball breathed a collective sigh of relief when the Indians announced that Martin was in stable condition and expected to make a full recovery, his absence puts Cleveland back in the same spot it was prior to acquiring him in late July. Michael Brantley is performing well again as the team’s regular left fielder, but the rest of the outfield mix is comprised by struggling rookie Greg Allen and poorly performing veterans Rajai Davis and Melky Cabrera. It seems reasonable to expect that the team will be on the hunt for additional outfield help between now and Aug. 31. Indians skipper Terry Francona says the club anticipates that breakout righty Trevor Bauer will be sidelined for four to six weeks with a fibula stress fracture, as T.J. Zuppe of The Athletic was among those to tweet. That’s obviously a huge disappointment for a pitcher who has emerged as one of the best in baseball this year. With the postseason beckoning, it’s also a big concern for the Cleveland ballclub. Of course, the team will not need to worry about the loss down the stretch with the division all but in hand. But it’ll certainly be interesting to see just how Bauer is brought along as the playoffs approach. It was a mixed bag of injury news today for the Red Sox, who will send third baseman Rafael Devers to the 10-day disabled list while activating second bagger Ian Kinsler. No further roster moves will be necessary to accommodate the change. Devers is hitting the shelf for the third time in the last six weeks or so and it’s the second occasion as to which the hamstring is to blame. That said, it’s not clear that the organization really believes there’s cause for concern that Devers won’t be at full strength come October. Tigers backstop John Hicks likely won’t make it back this year after requiring abdominal surgery, as Anthony Fenech of the Detroit Free Press recently reported. That’s a disappointing turn for a player who has turned in a solid performance in a robust role this year. Hicks, who is nearing his 29th birthday, has hit within range of league average at the MLB level since landing in Detroit. While he has been miscast as a part-time first baseman, his offensive work is more than adequate for a time-sharing catcher. The Rangers have placed center fielder Delino DeShields Jr. on the 10-day DL with a finger fracture. He suffered the break to the tip of his right middle finger. Drew Robinson will be recalled to take the roster spot. It has been a tough year at the plate for DeShields, who turned 26 just yesterday. He has swiped 18 bags on the year, but carries only a .204/.303/.272 slash over 348 plate appearances. As the Rangers look ahead to an offseason of uncertainty, they’d surely like to see DeShields in action as much as possible, so the hope will be that he can bounce back relatively quickly. Elsewhere in Texas, the slumping Astros were glad today to get some promising injury reports. Outfielder George Springer was activated off of the 10-day DL, as Chandler Rome of the Houston Chronicle reports (Twitter links). Meanwhile, star second bagger Jose Altuve will likely need a rehab stint but seems to be progressing from his knee issues. The ’Stros are trying to hold off a surprisingly strong challenge in the division. Nationals righty Jeremy Hellickson is destined for his own DL stint, as Pete Kerzel of MASNsports.com was among those to report. Fortunately, he’s dealing with a sprain rather than a break in his wrist, which was injured in a play at the plate. It seems the Nats are hopeful that Stephen Strasburg could be ready to return by Tuesday, when Hellickson was next scheduled to start. Losing Hellickson would only be the latest blow for an organization that has dealt with problem after problem in 2018. While it’s still not impossible to imagine a late surge, the Nats need all hands on deck to make a comeback plausible. For the Cardinals, it has been all positives of late. But the team could still stand to get a few pieces back. In particular, righties Michael Wacha and Carlos Martinez are on the come back trail. As MLB.com’s Jenifer Langosch tweets, Wacha is set to begin a rehab assignment in short order and Martinez is now working in a relief capacity in the minors. In the case of Martinez, the plan is for him to shift to the bullpen when he is ready to roll, which perhaps won’t be far off now that he’s pitching competitively. Among many notes of interest in his deadline run-down (subscription link), Ken Rosenthal of The Athletic writes that the Indians made a run at Ian Kinsler before the Angels instead sent him to the Red Sox. That move would have bumped incumbent second baseman Jason Kipnis into the outfield mix and perhaps precluded the Indians’ eventual acquisition of Leonys Martin. As things stand, the Cleveland organization still seems a plausible buyer of infield help on the August trade market (particularly considering Kipnis has hit a paltry .200/.217/.311 so far since the All-Star break), though they’re also likely to explore additional outfield upgrades as well. With MVP candidate Jose Ramirez being a perfectly capable second baseman, the news that the Tribe pursued Kinsler implies that they might also be open to potential third base upgrades; the club was already known to be heavily in on Manny Machado before he was shipped to the Dodgers. That could include the likes of Josh Donaldson, should he return to health before the end of August. It’s worth noting that the Indians also have third baseman Yandy Diaz waiting in the minor-league wings, though his defense has a malignant impact on his value. Then again, it could simply be that the Tribe saw Kinsler as a significant enough upgrade to pursue him ahead of most available outfield options. That being said, outside of Donaldson the outfield options who could potentially be had in August are far more interesting than any of the infield options who might clear waivers. Andrew McCutchen, Kole Calhoun and Avisail Garcia are some of the names who the Indians might be willing to pursue were they to stick with Kipnis at his natural position, though that’s simply my own speculation. The Red Sox have officially placed the recently-acquired Ian Kinsler on the disabled list and moved fellow second baseman Dustin Pedroia to the 60-day DL. Infielder Tony Renda has been added to the MLB roster to take Kinsler’s place. Kinsler, of course, recently came to Boston by way of a July 30th transaction that sent a pair of minor leaguers to the Angels. The Red Sox also received about $1.83MM in the swap. The 36-year-old had already amassed four hits in just 11 plate appearances with the Red Sox and has enjoyed a strong season to date, accruing 2.1 fWAR across the 2018 season in part due to typically stellar defense. It remains to be seen how the Sox plan to proceed in Kinsler’s absence. The “tight hamstring” probably won’t shelve the veteran for too long, but it’s not as though Boston has a host of capable keystone defenders. Following the removal of Kinsler from last night’s matchup, MVP candidate Mookie Betts shifted from the outfield to second base (his natural position, though one he hasn’t played since 2014). As for Pedroia, it would appear that recent concerns were not without cause. Following offseason knee surgery, the veteran (and one of the long-time faces of the Red Sox franchise) hasn’t been able to make a clean comeback to the field. Of course, it’s worth mentioning that Pedroia has already been back on the disabled list for over 60 days, so this transfer won’t in and of itself affect his timetable to return to the field. Still, there’s been no word of any change to his status. The Mets announced today that they have placed lefty Steven Matz on the 10-day disabled list with a flexor pronator strain. That sounds a bit frightening, though indications are that it’s not a terribly concerning injury situation. Still, any arm troubles are somewhat more worrisome for a young hurler that has experienced so many already since his 2015 debut. Matz, who will be replaced on the active roster by right-hander Corey Oswalt, joins Phillip Evans on the shelf. The 25-year-old infielder suffered a non-displaced fracture of his tibia, though it is perhaps still possible he’ll be able to return to action this season. The Astros have placed reliever Chris Devenski on the 10-day disabled list with left hamstring tightness, the club announced. He’ll be replaced on the active roster by southpaw Cionel Perez. Devenski had been cruising through another dominant season before he imploded very recently. Devenski had a 1.32 ERA as of July 1st, but has since allowed 13 earned runs in seven outings — including eight without recording an out over his past two appearances. Clearly, something isn’t quite right, so the ’Stros will give him a chance to get back to full health before the stretch run. Also heading to the DL is Mariners righty Juan Nicasio, the team announced. He’ll be replaced by reliever Chasen Bradford. Knee problems have been an issue for the 31-year-old Nicasio this year. He’s now sporting a 6.00 ERA through 42 frames on the season, though he’s also carrying a sparkling 53:5 K/BB ratio. Just-acquired Red Sox second baseman Ian Kinsler is likewise set to hit the DL after leaving tonight’s game with a tight hamstring, Bradford tweets. The seriousness isn’t yet apparent, but it doesn’t appear to be a major source of concern. Kinsler will be replaced for the time being by infielder Tony Renda.